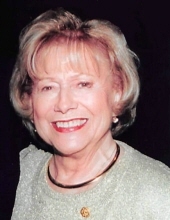 Lois Seidel (nee Wellman) of Lake Forest, IL., passed away peacefully of natural causes on March 8, 2019 at Lake Forest Hospital in Lake Forest, IL. She was 97 years old. Lois was predeceased by her beloved husband, Gerhard E. Seidel “Gerry” whom she married April 27, 1943. Lois grew up in River Forest, IL, one of five children of the late Arthur and Amanda (nee Thoms) Wellman. She was a graduate of the Grace Lutheran School in River Forest and Oak Park High School, class of 1940. She also attended Beloit College. As she was a war bride, when Gerry left to serve in the Pacific during World War II, she was at home working for the War Production Board, The American Red Cross and City National Bank (Chicago). Later she became a member of the Oak Park River Forest chapter of the Infant Welfare Society which became a lifelong membership for her culminating in her joining the Lake Forest Infant Welfare chapter and co-chaired the first Designers Decorator Showcase House held in 1985. She was a devoted wife and loving Mother of two children: Robert (Marsha) Seidel and Sarah (Willard) McNitt; eight grandchildren: Patrick (Kelly), Bridget (Paul), Marguerite (Jeremy), Amanda (Anselm), Charlotte (Jonathan), Willard IV, Robert (Zoe), and Emily; loving great grandmother to 11 great grandchildren. She adored her family which she always said was “her life” as well as her wonderful friends, but most important was her strong faith in God as she was lovingly laid to rest by her church, Faith Lutheran in Lake Forest. To plant a tree in memory of Lois Seidel, please visit our Tribute Store. "Email Address" would like to share the life celebration of Lois Seidel. Click on the "link" to go to share a favorite memory or leave a condolence message for the family.